Every girls should experience a Tea birthday party. It's every little girl's dream, to have a chance to dress up and act as an adult. 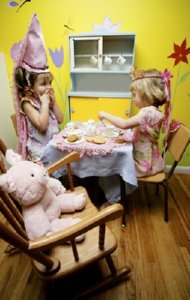 Girls love to dress up and play and that's what a Tea party is all about. Ask kids to bring their favourite teddy bear or dolly. Ask girls to dress up, they can dress as feminine and grown-up as they like. To make this Tea birthday party invitation, you need to cut out teacup shapes out of patterned paper. Afterwards cut out the same teacup shape out of cardstock. Glue the patterned teacup on top of the cardstock teacup. Write all the party information (Date, Time, Address, RVSP to "name & phone nr") on the none patterned side. The invitation should be hand delivered. To make this Tea birthday party invitation, you need to find a nice picture on the internet of little girls dressed up and having a tea party. Copy that picture and print it out in cardstock paper, make the invitation to look like an invitation card, with the picture in front. Write below the picture "Join Us For a Girly Tea Party" and inside the invite write all the party information (Date, Time, Address, RVSP to "name & phone nr"). If you don't have much time you can purchase teddy bear or doll invitations. Also, don't forget to ask guests to dress up and bring their own teddy bears or dollies to the party. You have to decorate your Tea birthday party very elegant. Decorate the party area with pink and white streamers and pearl balloons everywhere. Decorate the party area with teddy bears and dollies. Put a small teddy bear and a small doll facing each other and a small Tea set in front of them (on a table). If you can buy small teapot frames, you can fill them with random pictures of your daughters life and placed them around the party area. A good idea is to fill teapots with things. For example place a teapot in the Ladies room filled with ladies' amenities. Place another teapot in the party area filled with candy another teapot filled with fruit, etc. Use a lace table cloth and pink coloured napkins, dessert plates, etc. Also put tulle bows on chair backs. Put a big and unique looking teapot for centrepiece, it can be a Beauty & the Beast teapot, an antique teapot, a classic rose covered teapot, a Cinderella & Prince charming teapot, a Bugs Bunny teapot. The teapot has to be a unique teapot. Fill the unique teapot with chocolate or wrapped candies. Have some classic music or kids music (I'm a little teapot) playing in the background. Invite the girls to decorate their hats. Beforehand buy some hats, which can be decorated on. At party time invite the girls to decorate their hats using glue gun and pink and white plastic gems in different shapes (such as dragonfly, butterfly, ladybug, etc), feathers, small plastic flowers, etc. Invite the girls to decorate their on set of gloves. Beforehand buy each child a set of white gloves. At party time let the children decorate them with clothing paint. Invite the girls to make tea party cookies. Beforehand make sugar cookie dough. At party time provide the kids with some small cookie cutters in various shapes and some sprinkles and pink frosting gel. This game is so much fun and similar to bingo. Beforehand make game-boards with the help of your computer using teapot clipart. At party time call out a picture, the girls then have to cover that picture with a penny. The first that gets three in a row wins a prize. This Tea birthday party game is similar to Musical Chairs. Beforehand make lots of different large pictures of various teapots (with the help of your computer and teapot clipart). Start the game by letting each girl stand on a large picture of various teapots and playing classical music. Remove one of the teapots, when the music stops each girl has to stand on a teapot. The girl who is not standing on a teapot is out of the game. Play until there is a winner. Have a small price for the winner. This Tea birthday party game is similar to Pin the Tail on the Donkey. Make a picture of a teapot with out the teapot "handle". At party time blindfold the first kid to try to Pin The handle on the Teapot. Spin her around 2 times and give her a crayon. She has to try to paint the "handle" on the teapot with the help of a crayon. Give different coloured crayons to every kid. Have a small gift for the winner. Just let the girls play around with their teddy bears or dollies. It's lots of fun to see the girls play around and that is what kids love doing. Surprise the kids with a teapot piñata. To have a piñata at a birthday party is always fun and kids love them. Finish the party off with a story. Beatrix Potter story is a good story and it goes with the theme. Kids love anything that is small and it also looks more elegant. Pick one or two shapes and serve everything you can in those shapes: hearts, teddy bear, stars, flowers, etc. You can make sandwiches, cookies, scones, cookie bars in any form with the help of a cookie cutter. Finger Sandwiches: Serve peanut-butter and jelly sandwiches with the crusts cut off. Girli Sandwiches: With the help of cookie cutters, serve shaped sandwiches. Make small bite-size sandwiches. Fill the sandwiches with egg salad or any filling your daughter fancies. Heart Shape Cheese: Serve heart shaped cheddar cheese or another shape with the help of a star shape cookie cutter. Heart Shape Sugar Cookies: Make heart-shaped sugar cookies with the help of a star shape cookie cutter. Bear Cookies: Serve Bear shaped sugar cookies with the help of a bear shaped cookie cutter. Chocolate Mousse: Serve in teacups. Also, don't forget to serve all the drinks in teapots. Teas: Serve the teas your daughter fancies the most: strawberry tea, raspberry tea, vanilla tea, apple cinnamon tea, etc. I good idea is to make mini star shape cakes for your Tea birthday party. It looks nicer and it's more elegant than a normal cake. Start by making a sheet cake, any recipe. When done let it cool. Divide the cake in half and fill it with a filing, raspberry and orange butter cream filling is great if you have made a white cake, a peanut butter flavour butter cream goes well with a chocolate cake. With the help of a heart shape cookie cutter cut out heart shapes gently. These mini cakes are very elegant and beautiful. A good favor is tiny teapots filled inside with chocolate and candy. Wrap the teapots in tulle with a ribbon. In addition, each child gets to keep all of her crafts from the party (hat, cookies and gloves). I hope our Tea birthday party ideas will help you plan a successful Tea birthday party.